Turnberry Point at NS 196 073 can be reached bywalking along the track to the lighthouse from the A719 Maidens-Turnberry coast road at NS 206 068, a distance of about 1km. The track is on Turnberry Golf Course ground and crosses fairways, so care should be taken not to disturb play or get hit by wayward shots! Parking can be a problem (e.g. double yellow lines on the main road) but visiting birders may be allowedto use a golf course car park just up the track, given due courtesy to the owners and preferably leaving some evidence ofmembership of a bird club on display. 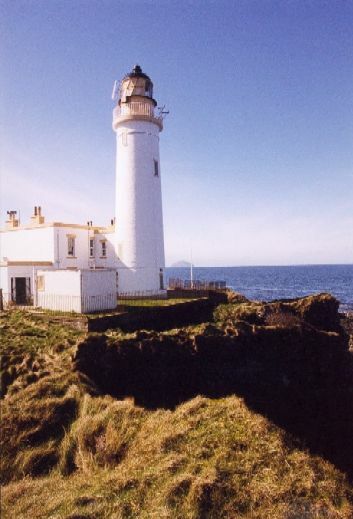 There is a bus stop at the start of the track and, with due care, cyclists can reach the track easilyfrom Maidens or Turnberry along the coast road. Park at golfer’s car park, gate difficult to open, frequently locked. The vicinity of the lighthouse is an excellent vantage point for sea watching, especially when a westerly wind blows the birds nearer the shore. There is a dune system to the south and the rocky coast to the north towards Maidens is a site of Special Scientific Interest. Possible sightings include good Manx Shearwater passages, and rarer shearwaters for those with good eyesight and patience! Storm Petrel , and Scoter are seen, including Velvet and, on occasion, Surf . In winter, there are high numbers of Red-throated, Black-throated and Great Northern Diver which often stay into spring giving close views of birds in breeding plumage, especially in Turnberry Bay to the south. The closeness of Ailsa Craig means that Gannet is guaranteed in the breeding season. Arctic and Great Skua can be seen on occasion and the site is good for auks, gulls, terns and Eider and Red-breasted Merganser . The beach is favoured by passage Whimbrel and other waders. Beside the track, the extensive low scrub cover together with the open ground of the golf course and headland provides good records of small birds: Whitethroat, Wheatear (including the Greenland race), Sedge and Willow Warbler, Tree Pipit, Twite and Stonechat (Siberian/Eastern race in 1998). The Course is of world class and has been host to international competitions. It is managed with sympathy for wildlife. A recently formed pool on the inland side of the coast road is worth scanning for ducks and waders. The golf course cafe is open to visitors and Turnberry Hotel welcomes the well-heeled. 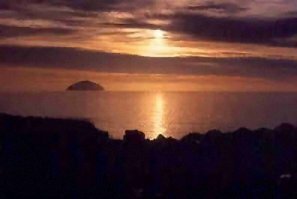 This entry was posted in Locations - South Ayrshire on 01-May-2003 .